Peter Finger is a better-than-average talent, hailing from Germany, discovered by series supervisor Stefan Grossman, and found here demonstrating a range on guitar and in composition that veers from thoughtful new age on the opening "Looking Back," with its repeating, brief, melancholy theme, to the improvisational (the title track). Interestingly, there's a very definite European sensibility at work here -- Finger isn't afraid to venture into areas American guitarists might see as too schmaltzy. He also isn't afraid to pull back and let other instrumentalists take center stage; in several cases, he effectively interweaves natural sounds with the music, as with "The Colors of the Night" and "No Man's Land." The European element also brings with it a certain contemplative tone that's accentuated as well by the alternative tunings used by Finger, and the thoughtful arrangements. Aside from the use of trap drums on "An Evening In August" the album tends toward the soothing and smooth, the calm overtone ruffled only by the odd bit of bluesy guitar work, performed without rancor. In some respects, that's excellent; on the other hand, one longs for a little more variation in tone. Nothing else on the album presents quite the sort of challenge of the opening number, but it's an interesting listen in any event, very comfortable, very probably destined for the local new age station. and very highly recommended to anyone who wants to know what to do with a guitar other than play complicated high-speed frippery on it. 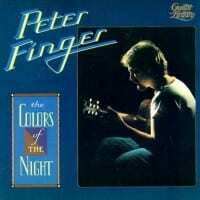 As with the other albums in Shanachie's Guitar Artistry series, The Colors of the Night comes with a tablature book to aid in learning how to play the various pieces on the album.